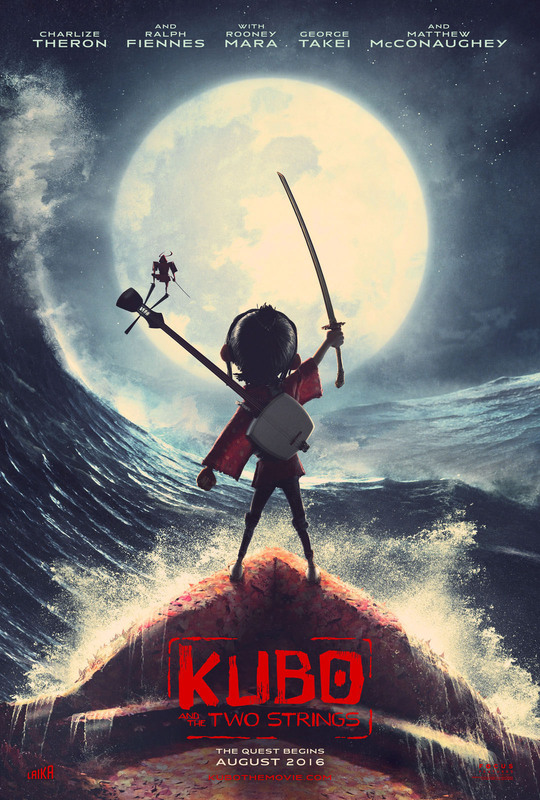 "Kubo and the Two Strings" is the latest animated feature from Liaka and is a very interesting story with amazing animated imagery and character design. This is stop motion at its best that blends together to tell an amazing story of Kubo and his journey. I don't want to spoil anything, because I saw it without seeing all the trailers and promotional material. I will say, if you want to be amazed and taken on an exciting journey, this is the film for you. If that's not your thing, then maybe "Sausage Party" is for you. Here are some of the animated armatures from the film. To call them puppets is almost an insult, since they are so alive on the big screen. I would also recommend watching this in 3D to get the full effect. And without spoiling any of the story, here is a few scene set ups from the film featuring Kubo, Beetle and Monkey. Here's a quiz for you: Travis Knight told me that The Moon King's facial design was inspired by two very famous movie villians. Can you guess who they are? If you live in the Los Angeles area, you can see a free exhibit, “The Artistry of Kubo: A Magical LAIKA Experience” at the Japanese American National Museum to coincide with the start of Nisei Week, the annual festival celebrating Japanese American culture and history in the Little Tokyo neighborhood of Downtown Los Angeles. Visitors will get a behind-the-scenes interactive peek at Kubo and the Two Strings through puppets, sets, props, monsters, origami, and costumes from the production presented in JANM’s George & Sakaye Aratani Central Hall from Saturday, Aug. 13 to Tuesday, Aug. 30.